Thanks to Jeff Goins, author of The Art of Work and blogger at Goins, Writer. You can also follow him on Medium. Some weeks, my desktop is a disaster: full of papers and files and sticky notes with half-baked ideas. Yes, I am your typical “creative.” Disorganized and disheveled, I proudly chalk it up to the artist in me. But if I’m honest, this is embarrassing. Clutter is not my friend; it is my enemy. Clutter is procrastination. It is the Resistance, a subtle form of stalling and self-sabotage. And it keeps me (and you) from creating stuff that matters. The mess is not inevitable. It is not cute or idiosyncratic. It is a foe, and it is killing your art. Before beginning her career as a successful author and speaker, Patsy Clairmont did something unexpected. She washed the dishes. She wanted to take her message to the world, but as she was readying herself, she felt nudged to start in an unusual way. She got out of bed and cleaned her house. In other words, Patsy got rid of the mess. And it put her in a position to start living more creatively. We must do the same. Bringing your message to the world does not begin on the main stage. It starts at home. In the kitchen. At your desk. On your cluttered computer. You need to clear your life of distractions, not perfectly, but enough so that there’s room for you to create. 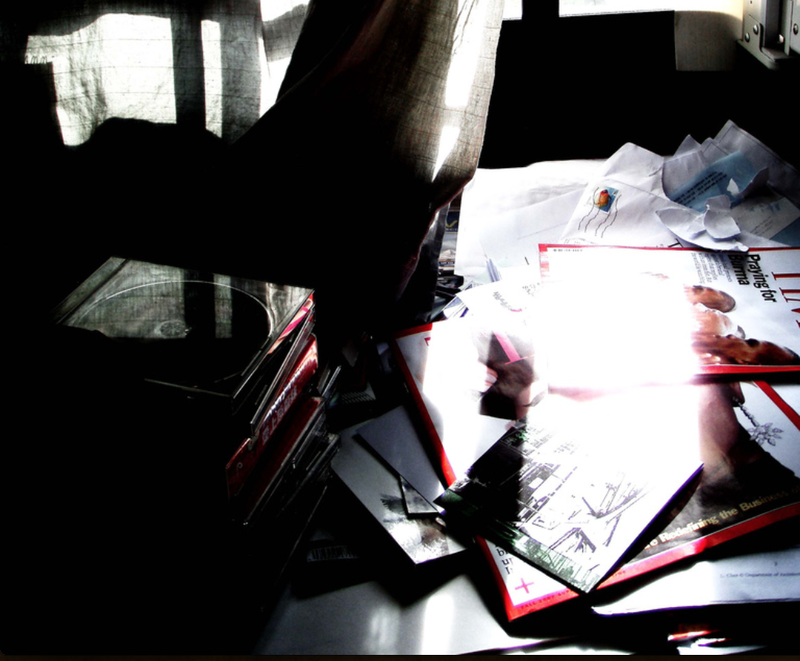 The relationship between clutter and creativity is inverse. The more you have of the former, the less you have of the latter. Mess creates stress. Which is far from an ideal environment for being brilliant. Jack White has an interesting philosophy on creativity. He believes less is more, that inspiration comes from restriction. If you want to be inspired, according to Jack, then give yourself boundaries. That’s where art blossoms. If you can’t say it in three minutes, you can’t say it in 30. We spent the week of the conference writing and delivering five-minute speeches every day. We learned that if we couldn’t summarize our ideas in a few short sentences, then we couldn’t elaborate on them for half an hour. Sure, we could ramble and rant. But that’s not communicating. It’s word vomit. I’ve learned to do this with writing. If I can’t say what I want in a sentence or two, then I’m not ready to share the idea. Prematurely broadcasting an idea before it can be described succinctly will cause you to lose trust with your audience and cost the integrity of your message. When attention is sparse, the people with the fewest, most important words win. In a world full of noise, it’s nice not to have to weed through digital SPAM to find the nuggets worth reading. But this doesn’t come naturally. Succinctly getting your point across is a discipline. I like to talk — a lot. I often process ideas out loud as they come to me. But I find this frustrating when other people do it. So I’m trying to master the art of clutter-free writing. Here’s what I do: I write and write and write, getting all my on “paper” (or computer or whatever). Then, I take out as many words as possible while still clearly communicating my message. Because if I can say it in five words instead of 15, I should. Reclaim your inbox. Throw away magazines and newspapers you have no intention of reading. Clean up your email, getting it down to a manageable amount (zero, if you can). Clean up your desk. Again, throw away stuff you haven’t used in months. Find a clean space to create. This is different for everyone, but it needs to not stress you out. Limit distractions. Turn off email, phone, and social media tools. Force yourself to focus on one thing at a time. Start creating clutter-free messages. Remember: less is more. Use restrictions to be more creative. Repeat this for the rest of your life. How do you deal with clutter and creativity? Share in the comments. I write books and help writers get their work out into the world. I am the best-selling author of four books, including The Art of Work. Each week, I send out a newsletter with free tips on writing and creativity. Fourteen articles to inspire you. More beautiful quilts from the Utah show. Surprising exhibit at the Philadelphia Museum of Art. A children’s book illustrator describes her process. Remembering the great American conductor and composer, Leonard Bernstein. I really needed this encouragement to let go of stuff. Some ideas for practicing zentangle. An adorable poem, found when touring OctPoWriMo submissions. Here’s a group project for you and your friends.